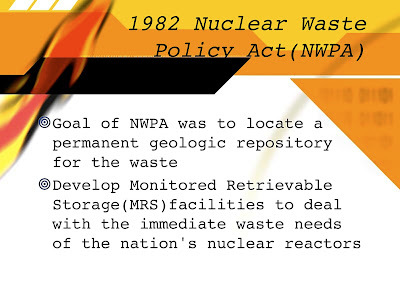 Slide 2: Storage of nuclear waste is one of the most important environmental issues of our time. Hanson, Randel. 1995. "Indian Burial Grounds for Nuclear Waste." Reproduced from Multinational Monitor, Volume XVI, No. 9, September 1995. Slide 3: The tendency to want to store this in “uninhabited” areas means that this is also a serious issue for Indigenous peoples, who often do inhabit those areas. This of course makes it an important environmental justice issue. 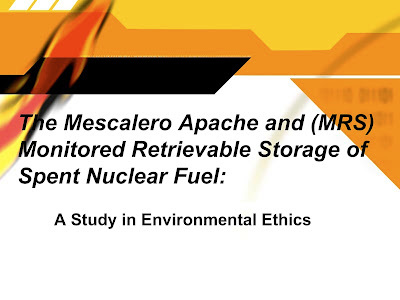 Slide 4: Nuclear power seems to be a solution at one level, because it is “clean” energy that does not produce air pollution or greenhouse gases, but nobody knows what to do with the waste, which is radioactive and will be so for the next 10,000 years. For comparison 10,000 years ago no modern countries or contemporary peoples existed in their current states. 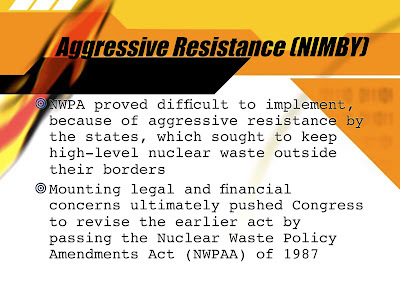 Slide 5: This situation produces the ultimate in NIMBY (Not in my Back yard) situations because no one wants nuclear waste anywhere around places they are going to live or have other activities. Slide 6: This is not all that different than the situation with the Haskell Wetlands, where an Indian College has been offered money and improvements not to resist expansion of the Lawrence Trafficway. Slide 7: The US government hoped to solve the NIMBY problem by getting communities to compete for the jobs and money that a nuclear waste storage facility would provide. 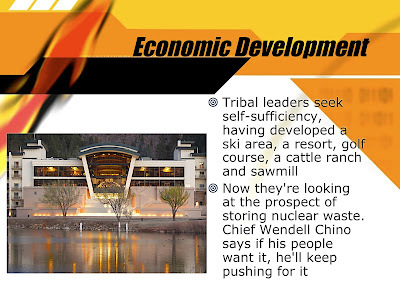 Slide 8: Obviously the next step was to appeal to tribes to see if they wanted this kind of economic development, so they went to NCAI to ask about this. 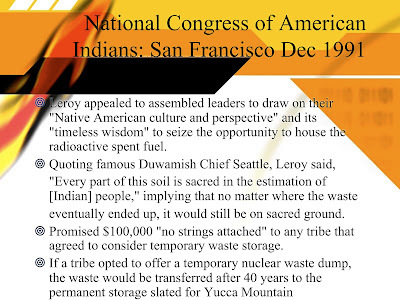 Their argument was strange in that anywhere this waste would be stored would be sacred ground, so why not Indian reservations. Slide 10: By the end of the process only three tribes were left and all were in desert areas designated as national sacrifice zones. The 4th tribe voted against having such a facility on their land. 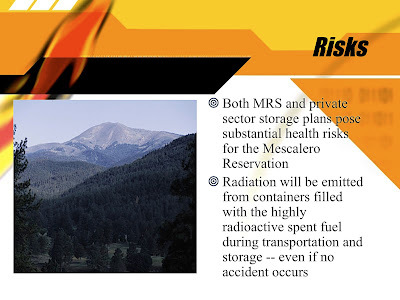 Instructors might want to initiate a discussion amongst their students about jobs vs. the risks involved in nuclear waste and whether they would want such a facility. 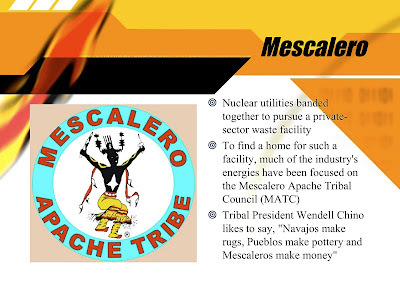 Slide 11: Ultimately the only tribe left was the Mescalero Apache, who have accepted the idea of capitalism and job creation as much as any tribe, and have been quite successful. 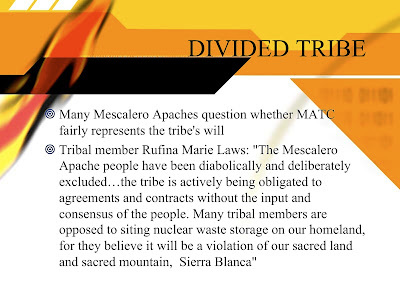 Slide 12: The tribal council (MATP: Mescalero Apache Tribal Council) pushed this even over the objections of some tribal members. 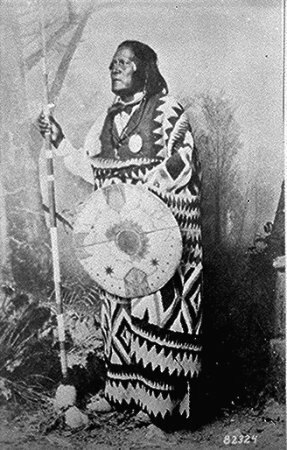 It ended up with descendants of Geronimo opposing descendants of Cochise in a revisiting of old tribal feuds. Slide 18: An important discussion can be held over the traditional Indigenous ways of governance that were based on long discussion and consensus compared to negotiations conducted by elected or appointed officials. 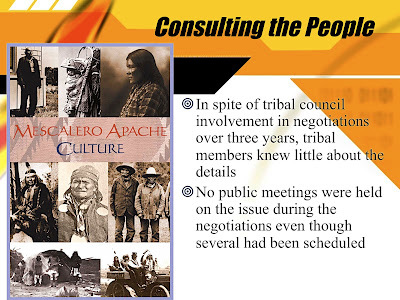 Slide 19: The debate hinges, as it often does, over the issue of employment, but is it a good idea to have tribal members employed in a project that could cause considerable harm to the environment and people by contaminating their land? 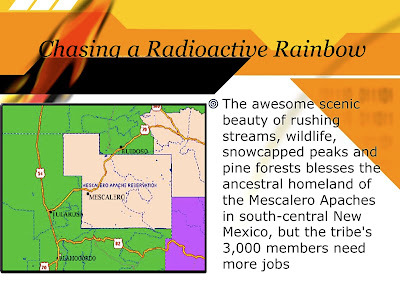 The image is important because it shows that the Mescalero Reservation is located just east of the Jornado del Muerto and Tularosa and Alamagordo, New Mexico where the original nuclear tests were carried out during World War II. Slide 21: Much of the economic development by MATP has not been that harmful, especially compared to nuclear waste storage. 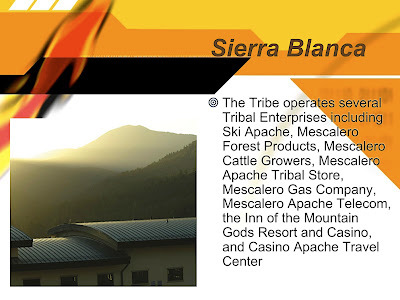 Is this a risk that they want to take; contaminating their sacred mountain, Sierra Blanca. 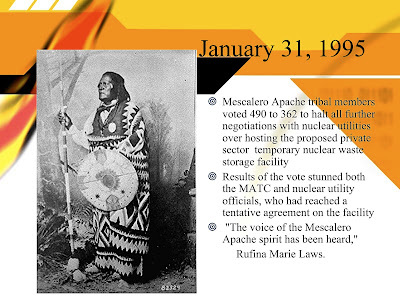 Slide 22: As with other tribes the Mescalero rejected storage of nuclear waste on their lands through a referendum. 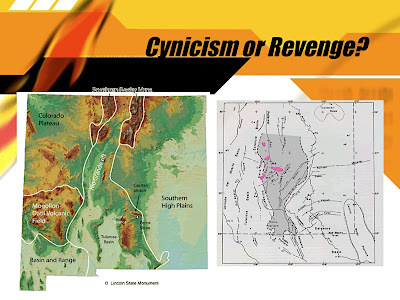 Slide 23: This map shows the location of Sierra Blanca and the Tularosa Basin. Because the storage facility would be located on the Western Slopes of the Sierra Blanca, If there are any leaks they would drain westward into the Tularosa Basin. The Tularosa Basin is where the US government first tested nuclear weapons during the Second World War, without notifying the Mescalero Apaches, and prevailing west winds blew radiation over the Reservation. Slide 24: Are the mountain spirits still watching over the Mescalero? 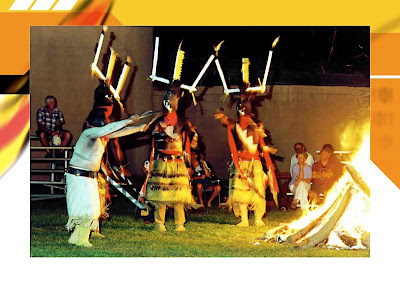 This image shows the Gan, the mountain spirits of the Apache and Sierra Blanca as represented through traditional dance.